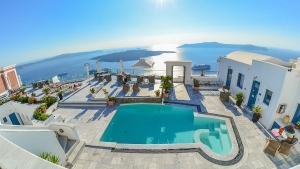 Volcano View Hotel stands majestically on the edge of the cliffs of Santorini's caldera. It is the largest cliff hotel and is situated 250m above the sea giving a magnificent view of the volcano, the sunset and the Aegean Sea . The hotel has 3 freshwater swimming pools. The largest pool with a pool bar is in the cliff area. The second pool is in the main building area and the last one is at the south side of the hotel. Hotel's restaurant is one of the finest of Santorini island and offers an incredible view of the caldera and the famous sunset. Guests can choose from the wide selection of traditional Santorini and Greek appetizers, fresh crispy salads, international cuisine and desserts, while admiring the unique view of Santorini’s Caldera. 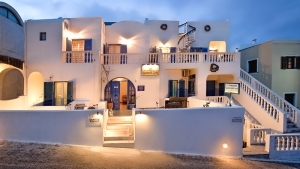 Volcano View Hotel is built in the traditional blue-white Cycladic style. 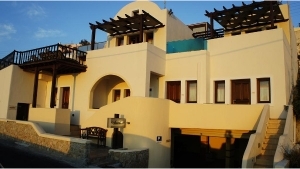 It is comprised of three areas, the Hotel, perched atop the caldera cliffs offering fantastic views of the sea, the VIP Villas consisting of 5 luxury villas with private pools and the affordable East View Rooms, which benefit from the hotel’s facilities. All guestrooms have a private balcony or terrace overlooking the sea and the volcano. They are equipped with individual climate control units, satellite TV, kitchenette and hair dryer. 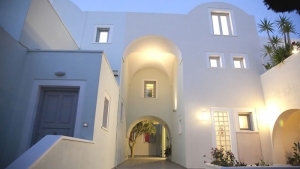 The hotel is located in the region of Agia Irini, just a short distance from the centre of Fira. The reception desk is open 24 hours for assistance and enquiries and guests are provided with free transfer to and from the town.